In 2001, Hellboy quit the B.P.R.D., leaving Abe Sapien to lead Liz Sherman and a bizarre roster of special agents in defending the world from occult threats, including the growing menace of the frog army, first spotted in Hellboy: Seed of Destruction. 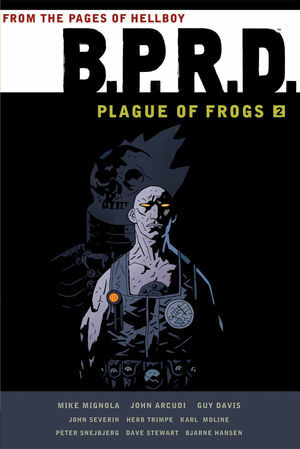 Mike Mignola and Dark Horse present the complete Plague of Frogs saga, from Hollow Earth to King of Fear. This first book explores the Bureau for Paranormal Research and Defense after Hellboy's departure, cracks open the secrets of Abe Sapien's origin, and sets the war on frogs in motion. * Mike Mignola teams with cowriters Christopher Golden (Baltimore), Geoff Johns (Blackest Night), Tom Sniegoski (Buffy the Vampire Slayer), and others for occult adventure drawn by Ryan Sook (X-Factor), Cameron Stewart (Seaguy), Scott Kolins (The Flash), and, making his Hellboy-universe debut, award-winning, longtime B.P.R.D. artist Guy Davis! * This hardcover collection includes the first appearances of Lobster Johnson and Johann Kraus! * Over 400 pages, collecting Hollow Earth, The Soul of Venice, and Plague of Frogs.